By now you know the impact you’re making by supporting KiDs Beach Club’s Bibles for Beach Club program. You know that because of you we are able to put a Bible in the hands of every child in every Beach Club. 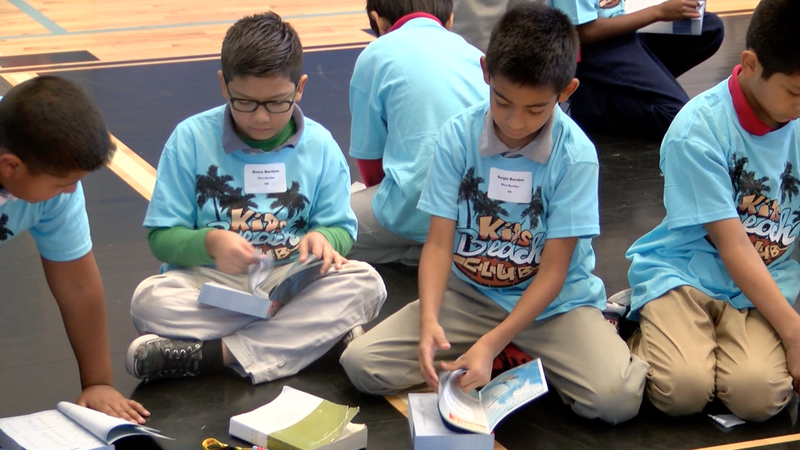 One church outside of Dallas, Texas is helping provide God’s Word to even more children and they’re utilizing Beach Club kids to deliver it to their friends who don’t yet have a Bible. Royal Haven Baptist Church sponsors a Beach Club at George H.W. Bush Elementary School in Addison. Nearly 100 kids have signed up for Beach Club this year. They received their KiDs Beach Club® Explorer’s Study Bible when the Dallas Independent School District campus held its Great Treasure Day in late October. Some children had already received a Bible at Great Treasure Day last spring. This fall, they provided KBC Bibles to another 72 children who had not attended the club prior to this year. Of course, what makes this Beach Club different is that every child in that club had already received a Bible from the church. Royal Haven volunteers provided Bibles to every child on the first day of Beach Club because they felt it was important to provide the Word of God the very first day the club meets. Great Treasure Day didn’t take place until the seventh week of Beach Club this year. What happens next is purely inspiring. At Great Treasure Day, they asked children who received a new KiDs Beach Club® Explorer’s Study Bible to give the Bible they got at the start of the year to someone they know who doesn’t have a Bible of their own. Through your passionate participation in our Bibles for Beach Club program and in the spirit of #GivingTuesday on December 1, when you’ll continue to help us #GiveKiDsCharacter, you’re showing these kids how to be generous by essentially DOUBLING the number of children receiving Bibles at Bush Elementary. It’s because of your unselfish attitude and your willingness to share with others that is helping #GiveKiDsGenerosity. Thank you for your continued support!